The representatives of the "National Security State" (NSS), as Gore Vidal termed it, are gleeful and chortling at the seizure of Julian Assange from the Ecuadorean embassy. They have little time for such niceties as journalism that doesn’t merely speak truth to power but mocks it. Ridicule and embarrassment are intolerable for national security obsessives. For them, security is an all-consuming Moloch that needs constant pacification. The first blast of satisfaction for the NSS came with the ill-chosen words of Judge Mark Snow, presiding over Assange’s charge of skipping bail in the Westminster Magistrates Court. It did not take long for him to pronounce judgment, but rather than sticking to formulas, the judge was moral, vehement and dismissive. He had initially opened with a remark of frustration, waiting for Assange’s legal outfit to arrive. “This hiatus is,” he observed impatiently, “because we are waiting for your legal team.” While waiting, Assange could be seen thumbing through his copy of Gore Vidal’s History of the National Security State. “Your honour,” came the opening words of the legal side representing the case against Assange, “I represent the United States Government”. The matter of jumping bail in 2012 seemed to vanish into a footnote of historical murmurings. Left on the summit was the U.S. extradition request filed under a single charge of conspiracy to commit computer intrusion. To the issue of bail, Assange’s legal team insisted that he “had a reasonable fear from remand he would be extradited to the U.S.” But the red haze came down on the judge at the suggestion that the previous presiding judge, Lady Arbuthnot, “did not recuse herself”. Why not raise the issue before, went Snow? Now, he stated severely, “you are traducing the reputation of a fine judge”. The national security state works in humourless and not so mysterious ways. The NSS pretends to be cunning. Language is carefully selected. The charge against Assange is specifically designed to duck under the First Amendment of the U.S. Constitution while keeping secrecy inviolable. 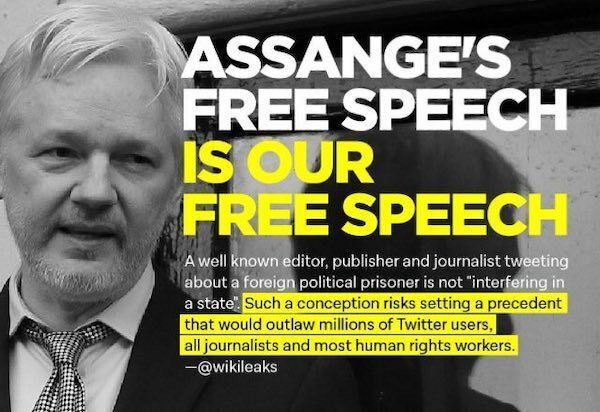 To wade into that jungle – Assange the journalist, the publisher, the promoter of ideas and discussion against the illegalities of the state – would imperil a prosecution case. Journalists, at least in some good measure, have been able to shelter behind the free speech provision. Important, then, to designate WikiLeaks and Assange’s behaviour as something else. Whistleblowers and investigative journalism, both nourished by circumstances often deemed illegal by the NSS, are the objects of this entire affair. Precisely. To that end, this elastic and amorphous term was alleged to be relevant to an illicit and illegal pact with Chelsea Manning, who accessed four databases 'from departments and agencies of the United States'. Ostensibly, this agreement involved Assange pressing for information, to be secured via 'a password stored on United States Department of Defense computers connected to the Secret Internet Protocol Network'. Manning thereby gathered the 'classified information related to the national defence of the United States' and relayed it to WikiLeaks to 'publicly disseminate the information on its website'. The validation of the NSS case against Assange has always had the insidious support of media outlets and hacks who preferred to see the WikiLeaks publisher as clownish, vain and paranoid. Assange’s treatment of his pet cat was far more interesting than any activity that exposed an atrocity or removed the mask of state hypocrisy. Nor did they care that their entire craft might be coming in for a drubbing — they, after all, were hardly going to threaten the status quo of power and could be duly accommodated. What is clear as polished crystal is that the NSS in its various manifestations has dedicated millions to the task of apprehending Assange but always claimed it was a grand act of exaggeration. It has done so, undercover — a fog that was meant to be, on some level, measured. But the national security state revealed its cards that day determined men went into the compound and removed, by force, an ill and desperate man holding a book with immense difficulty. This, no doubt will be dismissed as a stage prop for posterity; in reality, it is a cry from an abyss that promises to be all-consuming. In Rundle’s words, 'The Assange case is the criminalisation of investigative journalism'.